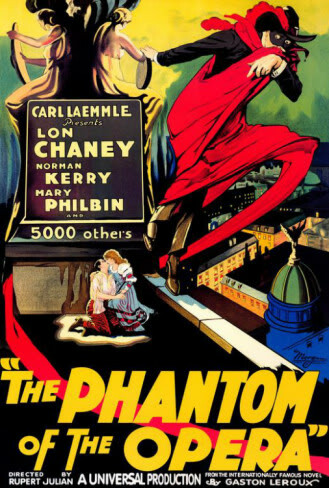 The Phantom of the Opera (Le Fantôme de l’Opéra), by Gaston Leroux, was first published as a serialization in Le Gaulois on 23 September 1909. It features a character named Christine Daaé who travels with her father, a famous fiddler, throughout Europe and plays folk and religious music. She I s brought to rural France by a patron, Professor Valerius after both her parents die. As a child her father told her many stories about the “Angel of Music,” who is the personification of musical inspiration. Christine meets and befriends the young Raoul, Viscount of Chagny. One of Christine and Raoul’s favourite stories is one of Little Lotte, a girl who is visited by the Angel of Music who possesses a heavenly voice. Christine is eventually given a position in the chorus at the Paris Opera House (Palais Garnier) and begins hearing a beautiful, unearthly voice which sings to her and speaks to her. She believes this must be the Angel of Music and asks him if he is. The Voice agrees and offers to teach her “a little bit of heaven’s music.” The Voice, however, belongs to Erik, a physically deformed and mentally disturbed musical genius who was one of the architects who took part in the construction of the opera. Erik falls in love with Christine And has also been extorting money from the Opera’s management for many years, and is referred to as the “Opera Ghost” by the denizens of the Opera. Christine triumphs at the gala on the night of the old managers’ retirement. Her old childhood friend Raoul hears her sing and recalls his love for her. He then hears the “Angel of Music” speaking to Christine. The Paris Opera then performs Faust, with the prima donna Carlotta playing the lead, against Erik’s wishes, in response Carlotta loses her voice and the Erik drops the grand chandelier into the audience causing carnage. After the accident, Erik kidnaps Christine, brings her to his home in the catacombs beneath the opera House and reveals his true identity. He plans to keep her there for a few days, hoping she will come to love him. Christine begins to find herself attracted to her abductor, until she unmasks him and, beholds his face, which according to the book, resembles the face of a rotting corpse. Erik goes into a frenzy, stating she probably thinks his face is another mask, and whilst digging her fingers in to show it was really his face he shouts, “I am Don Juan Triumphant!” before crawling away, crying. Fearing that she will leave him, he decides to keep her with him forever, but when Christine requests release after two weeks, he agrees on condition that she wear his ring and be faithful to him. On the roof of the opera house, Christine tells Raoul that Erik abducted her. Raoul promises to take Christine away to a place where Erik can never find her. Raoul tells Christine he shall act on his promise the next day.